The other day I was looking at Jen Muraoka's blog and one of her sidebar buttons caught my eye. It was a link to theTwo Scoops Rice Designs blog and from there I found their store site. I had been looking for a while for cute Japanese themed food stamps because I grew up on that food and thought it would be cute to make cards with it. So I went over to the store site and found the cutest stamps! I got two Christmas ones and this 2 scoops ice cream stamp (there were a ton more that I wanted but I have to wait). They came within just a few days and I just had to use one right away. I used the mojo monday sketch shown here to make this card. note: I made the links so they'll open up in a new window. I thought I would make links like this for other sites and for links within my own blogs I would not make them open in a new window. If it bugs anyone that the links open in a new window let me know and I will cease and desist. This is so cute! I love the bg paper and the ribbon!! Totally matches perfectly! Can't wait to see what you make with the Jp stamps! I don't want to go look at the website...it is going to cost me, I can tell already. So cute! What a cute image, but so bad, because now I want an icecream too! ;) Love the bright colours on your card! 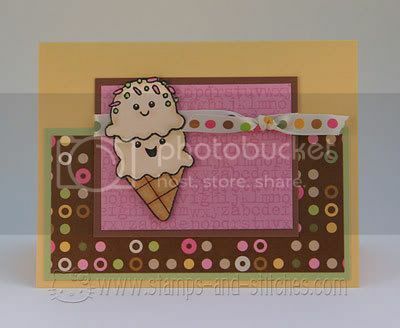 Oh this is just tooo cute ... LOVe those papers and the colors and the icecream is so cool... your LO is very coo!!! And I love the navigational feel of your blog - very cool!! you totally are a rockstar gale!!! The ice cream cone is too cute! Love the layout and colors. What an adorable image!! It is so cute, makes you want some ice cream! Love the bp you used and that ribbon matches perfectly! This card is CUTE!! I adore that ice cream cone image :) You did a beautiful job of coloring it too! Love this! Yum Yum Yummy this image is just 2 cute...Its just wonderful with the matching paper and ribbon...OUTSTANDING!!!!! This card is just precious! I love the colors and the happy Ice Cream stamp! Just precious!!! This is just the sweetest! What a totally adorable image and your card is gorgeous. How adorable!!! I love the colors and that stamp is so cute! So cute. The paper is great and the little ice cream cones make me want an ice cream cone, even though I'm freezing!!! That is just the cutest stamp I have ever seen! Great job on the crd! I love the paper you used! I WANT this stamp!!! I love it!!! Oh, and great patterned paper.